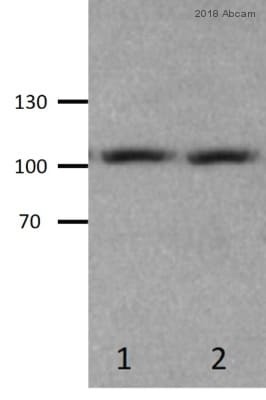 Rabbit polyclonal PGC1 alpha antibody. Validated in WB, ELISA, IHC, ICC/IF and tested in Mouse, Rat, Human, Zebrafish. Cited in 155 publication(s). Independently reviewed in 23 review(s). The immunogen sequence for this antibody is 78% homologous with PGC1 beta (Uniprot: Q86YN6). Synthetic peptide corresponding to Human PGC1 alpha aa 777-797. IHC-P: Mouse kidney tissue. ICC/IF: Human white adipose tissue progenitor cells. WB: Mouse Brown Adipose Tissue. This product may be covered by one or more of the following U.S. Patents. Shipped at 4°C. Upon delivery aliquot and store at -80ºC. Avoid freeze / thaw cycles. Our Abpromise guarantee covers the use of ab54481 in the following tested applications. WB 1/1000. Predicted molecular weight: 92 kDa. Use of nuclear extracts for WB is recommended since protein is nuclear and expression within whole cell lysate can be low. Transcriptional coactivator for steroid receptors and nuclear receptors. Greatly increases the transcriptional activity of PPARG and thyroid hormone receptor on the uncoupling protein promoter. Can regulate key mitochondrial genes that contribute to the program of adaptive thermogenesis. Plays an essential role in metabolic reprogramming in response to dietary availability through coordination of the expression of a wide array of genes involved in glucose and fatty acid metabolism. Induces the expression of PERM1 in the skeletal muscle in an ESRRA-dependent manner. Also involved in the integration of the circadian rhythms and energy metabolism. 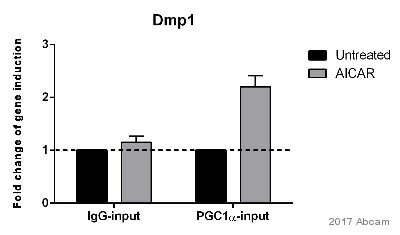 Required for oscillatory expression of clock genes, such as ARNTL/BMAL1 and NR1D1, through the coactivation of RORA and RORC, and metabolic genes, such as PDK4 and PEPCK. Heart, skeletal muscle, liver and kidney. Expressed at lower levels in brain and pancreas and at very low levels in the intestine and white adipose tissue. In skeletal muscle, levels were lower in obese than in lean subjects and fasting induced a 2-fold increase in levels in the skeletal muscle in obese subjects. Contains 1 RRM (RNA recognition motif) domain. Phosphorylation by AMPK in skeletal muscle increases activation of its own promoter. Phosphorylated by CLK2. Heavily acetylated by GCN5 and biologically inactive under conditions of high nutrients. Deacetylated by SIRT1 in low nutrients/high NAD conditions. Ubiquitinated. Ubiquitination by RNF34 induces proteasomal degradation. Cytoplasm. Nucleus; Nucleus and Nucleus. Nucleus, PML body. Immunocytochemistry/ Immunofluorescence - Anti-PGC1 alpha antibody (ab54481)Image from Mori M et al., PLoS Biol. 2012;10(4):e1001314. Epub 2012 Apr 24. Fig S1. ; doi:10.1371/journal.pbio.1001314; April 24, 2012, PLoS Biol 10(4): e1001314. 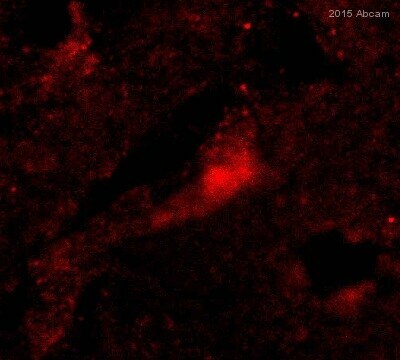 Immunofluorescence analysis of Human white adipose tissue progenitor cells, staining PGC1 alpha (green) with ab54481. Cells were fixed in paraformaldehyde and permeabilized in 0.1% Triton X-100 for 5 min. Cells were incubated with primary antibody (1/300) and staining was detected with Alexa Fluor® 546-conjugated anti-rabbit secondary antibody (1/1000). 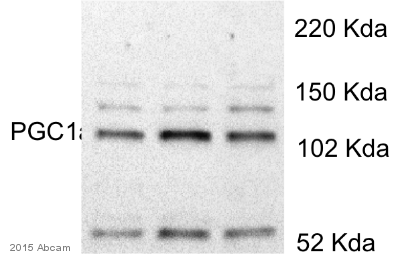 Western blot using ab54481 at 1:2000 to detect PGC1 alpha in Mouse brown adipose tissue whole cell extract (both lanes). Immunohistochemical analysis of mouse kidney tissue, staining PGC1 alpha with ab54481. Tissue was fixed with 10% Neutral Buffered Formalin and blocked with 0.25% protein block for 20 minutes at 25°C; antigen retrieval was by heat mediation. Samples were incubated with primary antibody (1/250 in 1% BSA + 0.5% skim milk) for 16 hours at 4°C. 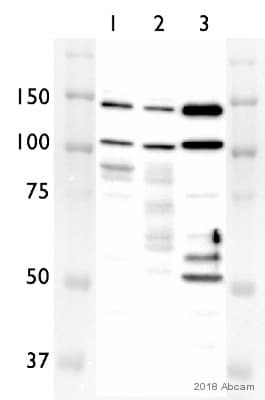 An HRP-conjugated goat anti-rabbit polyclonal IgG was used as the secondary antibody. Publishing research using ab54481? Please let us know so that we can cite the reference in this datasheet.